What a momentous day for human endeavour. 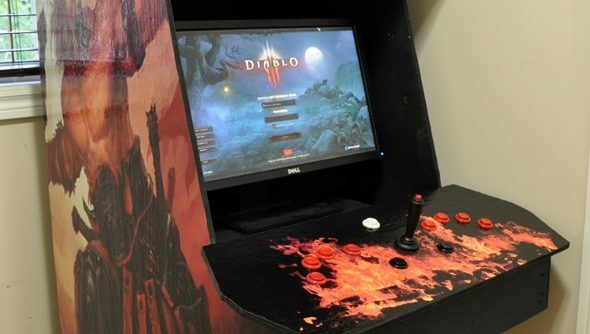 First we drop a big Johnny Five on Mars, and now a man in Canada has built a Diablo 3 arcade machine, which is wonderfully pointless enough to be considered actual art. The fully functioning plywood arcade cabinet maps game controls to joysticks and buttons in a way that’s probably not very conducive to scrapping with elite packs, but the video below shows that it’s a capable enough setup. Besides, shush, it’s a Diablo 3 arcade cabinet. Stop trying to pick holes in this. Take a look at the full blog post for more pictures and details. Interestingly, every button has dual-functionality when used in conjunction with another button, which is how skills and clicks alike are all mapped to the cabinet’s limited inputs. Of course, the game client had to remain unmodified for this project to work, as tinkering with that would’ve attracted the ire of Blizzard’s auto-banningDRM warden.